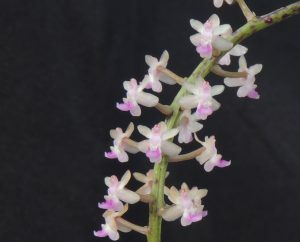 Cleisostomas are small flowered relatives of Vanda with a range of growth habits but rather similar prettly little flowers that tend to open successively along relatively long flower spikes. This is the ‘bent’ cleisostoma referring to the curved terete leaves. It is a warm growing species from South East Asia, India and Malaysia where it grows pendulously. 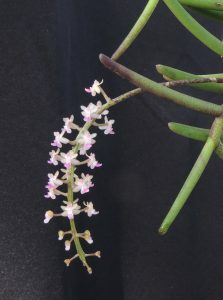 We have seen related species growing in Arunachal Pradesh, North East India, and in Laos, amongst a mass of orchids (Dendrobiums, Pholidotas, Erias and others) on the lower branches of semi-deciduous trees along rivers and in open forest. We find Cleisostomas work well mounted where their attractive growth habits can be enjoyed and the plants are able to dry out well between waterings. As this is a warm growing species we hang it high in our Warm Asia section where temperatures are highest.